In January 2014 the massive World War II-era underground fuel tank facility near Pearl Harbor was found to have sprung a leak, which immediately raised environmental concerns for spillage and contamination of drinking water. The leak, or “release” as the Navy reported it, of 27,000 gallons of jet fuel, didn’t visibly spill out like the devastating oil slicks in recent memory. It didn’t coat birds or choke fish; it didn’t blacken beaches, requiring hundreds of volunteers to help clean up. Navy officials initially weren’t sure it was a leak at all: they just couldn’t account for the missing oil in Tank 5. If it leaked, it went into the ground. Over the ensuing two years, the Environmental Protection Agency and Hawaii Department of Health have led the charge to test the tanks, monitor wells, and enforce Navy cooperation to reduce the risks of future leakage, protect groundwater, and operate in an “environmentally protective manner.” Part of the Navy’s challenge now is to find detailed information on the original construction of the fuel storage tanks, and that’s what led to an unusual query in my inbox a couple of weeks ago: In my research for Building for War, had I come across any papers of Morrison-Knudsen Company’s George Youmans, the project manager of Red Hill, or chief engineer C. P. Dunn? In 1940 the “Underground Fuel Storage” project was one of over a dozen big construction jobs in the second cost-plus-fixed-fee Navy contract with Contractors Pacific Naval Air Bases (CPNAB). Joining the CPNAB consortium with the new contract was Morrison-Knudsen Company which would take primary responsibility for three of the construction projects: Wake Island, Midway, and the Oahu fuel storage tanks. “Underground” meant tunneling, and that was right up Morrison-Knudsen’s alley. M-K President Harry Morrison chose VP George L. Youmans, to head up the company’s work in the islands. Youmans held a seat on the CPNAB Operating Committee, oversaw the Wake and Midway projects, and was project manager for the Underground from start to finish in 1943. During my research for the Wake Island book, I had found a rich trove of CPNAB documents and correspondence, particularly between Youmans and Morrison, in the M-K archives. While I’d filtered the documents for Wake, I remembered many references to Red Hill. Long story short, neither I nor my colleague, the records manager at AECOM (which is now the third generation owner of M-K), found any 75-year-old detailed Red Hill tank drawings for the current study. A couple of 1946 sources – David Woodbury’s 1946 Builders for Battle and an article in the M-K company magazine – highlighted the engineering feat, but I confess my eyes still blur when I try to read them. The Underground, conceived in 1940 to safeguard the Pacific Fleet’s vital oil supply from enemy attack, grew from four tanks to twenty in the course of three years. 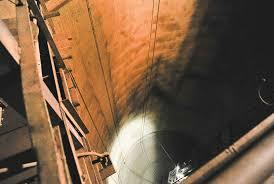 The key design component, credited to engineering consultant, James P. Growdon of ALCOA, was vertical tank construction, allowing excavated material to fall before removal via conveyor belts and tunnels. Each cylindrical, steel-lined tank measures 250’ by 100’ and holds 12.5 million gallons of oil (that’s 250 million gallons in the twenty tanks). One might reasonably call 27,000 gallons a drop in the Red Hill bucket. The mammoth tanks were built entirely underground by first blasting through subterranean rock, conveying the tons of “muck” out through tunnels and up big trestles to deposit in great mounds on the surface of Red Hill. It’s those mountains of excavated material that always come to my mind when thinking about Red Hill. In a long letter written to Harry Morrison in the aftermath of the attack on Pearl Harbor, George Youmans described the harrowing experience and the first days of rescue and recovery in the Harbor. “We have had to take many of our Red Hill crews away from the job too, to take care of other work in the [Navy] yard,” wrote Youmans on December 10. . .
We had to excavate trenches in the Nuuanu Cemetery for burials. That cemetery is now full, and we are burying the balance of the men killed on the sunk and burned battleships, just west of the high trestle we erected for the waste material from the underground tanks. We are digging deep trenches where the ground is high and laying the bodies on the ground and covering them with fill where the ground is low. When we finish we will level the area off with material from the waste dump. We will probably have 3,000 or more bodies in this area. And it is a sad and terrible sight to have to do this. Most of the bodies are burned to a crisp from the terrific heat from the burning ships. The odor is terrible and the flies are there by the millions. Some of the boys were taken from the ships yesterday and they were still alive. Others are still alive and can be heard pounding on the plates so perhaps a few more will be taken out alive. I hope so. With war, Red Hill became a top priority of the Navy. A work force of 3,900 labored around the clock until the tanks were completed in October 1943. The oil, piped three miles downhill to Pearl Harbor, fed the fleet in World War II and feeds the Pacific Command today. Red Hill enjoyed a brief moment of celebrity in the postwar flush, and then fell under the shroud of secrecy again during the Cold War. (Several hundred Pearl Harbor dead were disinterred from the site after the war and ultimately reburied in Punchbowl cemetery.) The underground storage facility was finally declassified in the 1990s. In 1995 it was designated a National Historic Civil Engineering Landmark. The Hawaii Department of Health has found evidence of dozens of recorded leaks since the 1940s and past navy inspections have revealed tanks “riddled with hundreds of defects,” which were patched and welded, though it isn’t known if these led to leaks. After the 2014 incident, Tank 5 was drained and vented, and the subsequent inspection revealed three microscopic holes in the bottom. 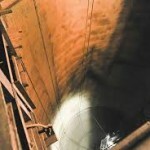 At risk is the Red Hill aquifer, the huge underground layer of water-bearing rock beneath the tanks. Well-monitoring readings indicate that the January 2014 leak did hit the aquifer, though not the drinking-water wells a mile away. So hold tight, big old tanks, until we don’t need you anymore; and good luck, aquifer.